In a world dominated by Disney princesses, it is always exciting when a new princess steps on the stage. In this beautifully illustrated story, we watch as Rosie, and her very accommodating parents, get ready for the Shabbat princess. Dressed in a satin gown, silver slippers, jewelry and a tiara, Rosie succeeds in preparing her home for the Shabbat princess, recreating her Shabbat table to be as inviting as possible for a Shabbat princess. 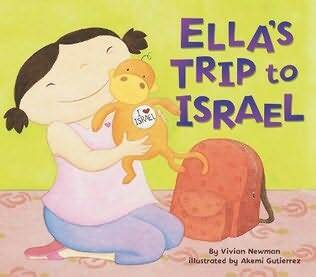 This story is a perfect one to read to your little ones on Erev Shabbat or over Shabbat. 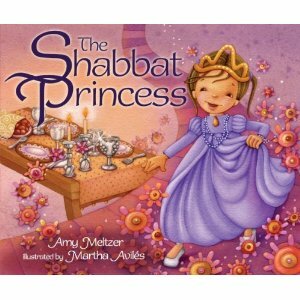 The story and illustrations will make you wish for a Shabbat princess of your own. 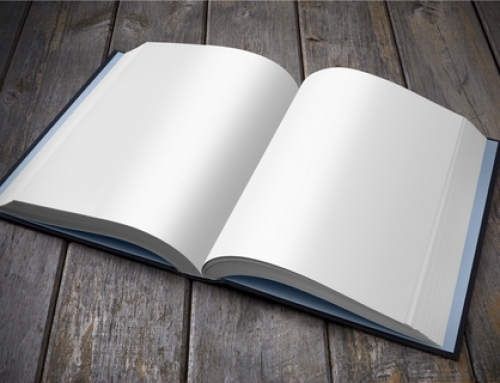 Since it’s Friday and I’m thinking ahead to Shabbat, I thought I’d blog about one of my favorite Shabbat books — Mrs. Moskowitz and the Sabbath Candlesticks by Amy Schwartz. Moskowitz (as my children like to call the book), is one of the first books published by the incredibly talented writer/ illustrator, Amy Schwartz, who is responsible for some of my favorite mainstream books — like Bea and Mr. Jones,Annabelle Swift, Kindergartener, and A Glorious Day, to name a few. 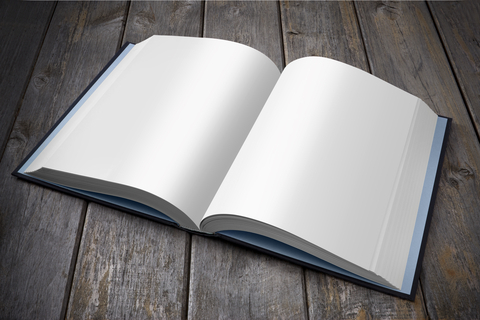 In this book, Schwartz creates a very special kind of Shabbat book — one that is perfect for families of all denominations and beliefs — no mean feat to be sure. Moskowitz is the story of an older woman who has moved from her family home where she raised her children into an apartment. “This apartment will never be a home,” she says at the beginning of the story. However, something almost magical seems to happen when her son Sam brings her a box in her old house, a box that contains her old Shabbat candlesticks. She puts them on the table and when she wakes up the next morning, she sees how tarnished they are in the sunlight. So she buys some polish for them. Once they are polished, they look so beautiful that she can’t help but feel badly that they are sitting on such a plain table, so she finds a tablecloth. And on, and on. While the candles don’t do anything special, by the end of the week, her apartment has been completely unpacked and turned into a home — and she’s decided to invite the family over to have a nice Shabbat dinner. It’s a lovely story — perfect for discussing the loneliness that older adults can feel, for playing games with your children that involve having them clean things (!). 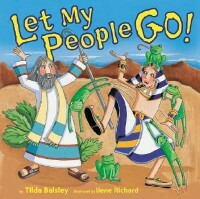 It’s a great book for sharing with grandparents (in my experience, a lot of parents and grandparents tear up during the story). It’s just plain lovely. It’s almost Shabbat and I’m thinking of the millions of things I won’t have time to do. Unlike the characters in Amy Hest’s The Friday Nights of Nana, I don’t spend the day getting ready: tidying things up, taking a nice walk to get flowers, baking an apple pie and putting on special clothes. But I really, really wish I did. “Is it time?” I ask. “Now,” Nana says, and finally it’s the best time. Nana is lighting candles and our dresses are touching and she is whispering Sabbath prayers and no one makes a peep. Not even Lewis. Outside, the wind howls. Snow whips up in great white swirls. But here inside, the candles flicker. A Sabbath song is in the air. It’s time for pie and we’re all here together on the Friday nights of Nana. 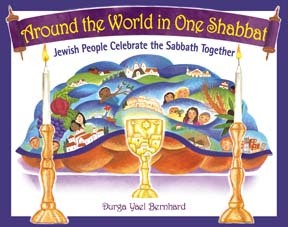 Around the World in One Shabbat. Jewish People Celebrate the Sabbath Together by Durga Yael Bernhard. From Israel to Thailand, from Australia to Canada, and from Ethiopia to Argentina, you and your children are invited to share the diverse Sabbath traditions that come alive in Jewish homes and synagogues around the world each week–and celebrate life with Jewish people everywhere.